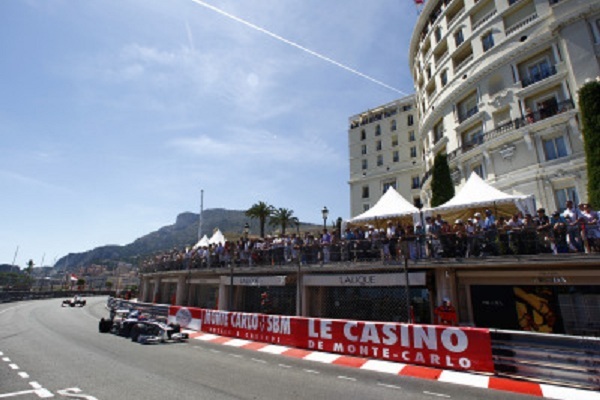 An enduring engagement on the Formula 1 schedule since 1955, the Monaco Grand Prix is considered by many as the most elite race of the season. Situated around the unapologetically pompous and rich surroundings of a European principality, the race projects an image Formula 1 of greatness the open wheel motorsport series aspires to embody. For 2011, the race welcomes the series being largely dominated by one ruler; Sebastian Vettel. Riding his noble Red Bull-Renault onto the streets of Monte Carlo, winner of four of the past five grand prix events enjoyed continuing success for the Monaco Grand Prix. Qualifying, Vettel received the some mixed luck as a result of a late session crash of Sergio Perez. Though Perez was unable to start the race Sunday, the crash ended the final qualifying session preventing other drivers from mounting a challenge to Sebastian Vettel's time. With Vettel's Red Bull-Renault starting on the pole beside McLaren F1's Jenson Button, the Monaco Grand Prix started predictably to the chorus of the 2011 Formula 1 season. Sebastian Vettel held the lead through the early stages of the event. However, while the reigning driver champion for Red Bull Racing led the field around the 3.340 kilometer (2.075 mile), this race was never a run away for Vettel. Through pit stop exchanges, Jenson Button led with his McLaren-Mercedes. Having won 15 times on the streets of Monte Carlo, the McLaren team passed the 10,000 laps led milestone in Formula 1 through Button's efforts. Deeper in the field, Button's McLaren teammate Lewis Hamilton reported to be nudged by Schumacher on the start of the grand prix. Limited to some rear wing damage, Hamilton's car would be a moving epicenter for dramatic in the Monaco Grand Prix. As McLaren seeks to reclaim some success in Monaco, the second-most winning team on the famous street course was also mounting hoping to mount a 2011 comeback. Qualifying 4th and 6th the Ferrari team cars were led in their pursuit of their first 2011 victory by Fernando Alonso. Alonso competed against Sebastian Vettel and Jenson Button for the top race positions throughout the Monaco Grand Prix. However, the second Ferrari driven by Felipe Massa would not be joining his teammate Alonso at the front. In the case of Massa, the Brazilian's race ended after the 32nd lap when he lost control in the traitorous tunnel section of the Monte Carlo circuit. 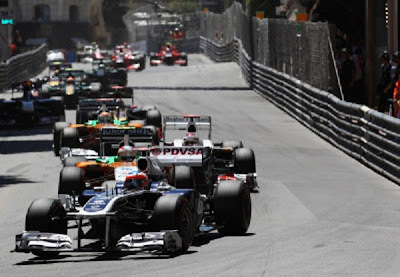 Leaving the 2011 Monaco Grand Prix with the most disappointing team performance was the Mercedes GP organization. Despite presence in the top-7 in qualifying, both Michael Schumacher and Nico Rosberg struggled. Missing race pace due to a premature wearing of the rear Pirelli tires, Mercedes GP engineers were caught off-guard by the extent to which performance dropped-off. Using a three-stop plan, Nico Rosberg finished the race 11th, two laps down to the leader. 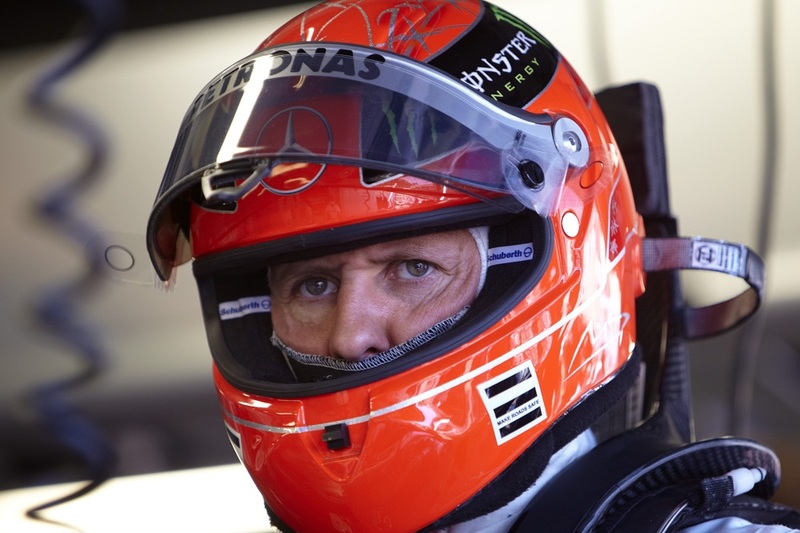 More veteran teammate Schumacher was unable to complete the 78-lap distance of the Monaco Grand Prix. Attributed to an air box failure, Schumacher's Mercedes GP retired almost at the same time of Massa. At the front of the field, Sebastian Vettel held the lead but Fernando Alonso and Jenson Button have closed a several second lead into the latter stage of the event. Staging what could be a fantastic three-way fight for the Monaco Grand Prix, the hopes were dashed when a series of events occured. Halting the event, a crash resulting when the McLaren of Lewis Hamilton and the STR-Ferrari of Jaime Alguersauri collided on lap 67. As Alguersauri headed wide into the wall, the Lotus Renault of Vitaly Petrov was collected in the meylay. Following the crash, Petrov required some extension care from the track clean-up crew and medical officials which put the field under a red flag. With a concern for a possible concussion and broken leg, the Russian driver Vitaly Petrov was later examined at Princess Grace Hospital with no indication of serious injury. Once the race was restarted, the Williams-Cosworth of Pastor Maldonado ran a very strong sixth place until a lap 73 move by 2008 F1 World Champion Lewis Hamilton robbed the 26 year-old Venezuelan of a good finish. Maldonado offered his impression of the how a good race turned badly saying "My pace was strong but after the re-start Hamilton tried a very ambitious manoeuvre at the first corner and that was the end of my race. I’m really disappointed not to come away with any points today." Following the two incidents during the Monaco Grand Prix, Hamilton was penalized 20 seconds by the Formula 1 stewards in post-race but retained a 6th place finish. Though the final red flag bunched up the remaining race contenders, the restarts did not help the Ferrari or the McLaren-Mercedes race cars. Alonso admitted through that the late race stoppage prevented the Ferrari from launching a final surge against Sebastian Vettel. Crossing the line for his 5th win of the 2011 Formula 1 season, Vettel and Red Bull Racing was victorious over second place Alonso. In third place came Jenson Button who was only 2.3 seconds behind the winning car of Vettel. Mark Webber pulled a last lap pass on the Sauber-Ferrari of Kamui Kobayashi for fourth place. As for Kobayashi, the Japanese driver was the lone Sauber in the field after Sergio Perez's car was withdrawn. Perhaps the entire team was competing with some added focus following the Perez crash, hard driving by Kobayashi and strategy of the Sauber team vaulted the car from 12th at the start to 5th in the final running order. On Sunday, the team updated Perez's medical condition by announcing the driver suffered a concussion and a bruised thigh. Whether the Sauber will be fit to run the next Formula 1 round in Canada will depend on further examinations Monday. As mentioned, the next round for the Formula 1 World Championship is the Candian Grand Prix in Montreal.